Kurnool city in Andhra Pradesh is fêted for its rich history, heritage and architectural marvels of south Indian dynasties. It was a former princely state and is hailed as the gateway to Rayalaseema as it is enroute to Kadapa, Chittor and Anantapur from Hyderabad. A go to place for history buffs, it's home to ancient historical sites, palaces and temples which are famous for their architecture and religious significance. No. Of Days Required For The Journey: It can be planned as a weekend trip. By Air: There is no airport in Kurnool currently, but the Ministry of Civil Aviation has proposed to build an airport at Orvakal, merely 25 km from Kurnool town, likely to be completed by 2019. By Rail: There are four railway stations in Kurnool district - at Kurnool town, Adoni, Nandyala and Dhone Junction, connecting Kurnool to all major cities of India. There are plenty of trains operating from Hyderabad to Kurnool. By Road: Both government and private buses ply from Hyderabad to Kurnool. Cabs also ferry commuters from Hyderabad to Kurnool at affordable rates. If one takes a road trip, the travelling distance to Kurnool district from Hyderabad is approximately 240 km. Anytime between October and March is ideal to visit Kurnool. Summer: Mercury shoots up to 40 degrees Celsius making the summers hot and humid. It's not advisable to visit Kurnool at this time of the year. Monsoon: Kurnool receives heavy rains during the monsoon months of July to September. 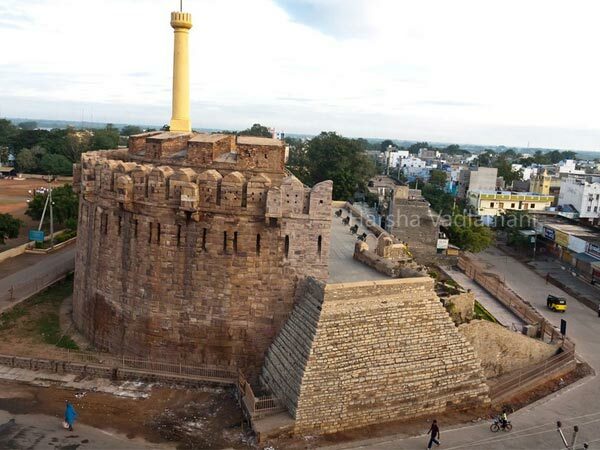 Post monsoons, the temperature drops and is the ideal time to visit Kurnool. Winter: The weather is pleasant and moderate with temperatures ranging from 20 to 30 degrees Celsius. It's recommended to visit Kurnool at this time of the year. Minimal baggage makes the trip hassle free. Carry essentials you require like clothes, phone, wallet, camera and plug-ins to keep your gadgets charged. Carry your travelogue to jot down points on the historical sites you visit. Don't forget to carry water bottles and some ready-to-eat goodies to snack on. Route 1: Hyderabad-Hasan Nagar-Shamshadbad-Gandiguda-Thimmapur-Mahabubnahar-Raichur-Mantralayam-Kurnool-Alampur, via NH44. Route 2: Hyderabad-Saidabad-Ranga Reddy-Kadthal-Mahabubnagar-Thirumalgiri-Munnanur-Mahabubnagar-Kurnool-Srisailam, via NH765 and SH5. If one opts for route 1, the journey takes almost 8 h through the sacred town of Mantralayam covering most of the tourist attractions - Kurnool Museum, fort, the neighbouring Shirdi Sai Baba and Bala Sai Baba temples, the Navabrahma Temples in Alampur and the unique Sangameshwara Temple. If one opts for route 2, the journey takes about 9.5 h. This route takes you through the holy town of Srisailam. Located on the Nallamala hills, this town is a popular pilgrim destination. This route also covers the Nallamala forest and other tourist attractions like Kurnool Fort, museum, Shirdi Sai Baba and Bala Sai Baba Temples and the Oravakkalu Rock Gardens. For those of you planning on taking route 1, the travelling distance would be about 385 km. One can stop over at the sacred Mantralayam town to pay a visit to the Sree Guru Raghavendra Swami Temple. It houses the Vrindavana built by the Guru, who is believed to be an incarnation of Bhakta Prahlada. Bhakta Prahlada was a staunch devotee of Lord Vishnu. The Guru is believed to be residing at the Vrindavana and would continue to live for the next 361 years. About 2 h from Mantralayam, at a distance of 94 km, one can halt at the Kurnool Archaeological Museum. It houses various artefacts dug out from Kurnool. They include the broken sculptures from the temples in the locality and weapons used by the local chieftains. In the vicinity, one can also visit the renowned Kurnool Fort, Shirdi Sai Baba and Bala Sai Baba Temples. The fort is an important tourist attraction and is also known as Konda Reddy Buruju. It was built by Achyuta Devarayalu of the Vijaynagar Empire. Mainly in vestiges, only the Konda Reddy Buruju remains of this splendid architectural site. Erra Buruju here is an example of the resilient ruins. It also has many attractive carvings and scriptures. Two ancient temples dedicated to Goddess Yellamma are located at the foot of this fort. The star-shaped Shirdi Sai Baba Temple is one of the biggest Sai Baba Temples occupying 1.5 acres of land. One can also pay a visit to the Bala Sai Baba Temple. One can then drive to the mythological town of Alampur, located at a distance of 23.3 km from the Bala Sai Baba Temple. Situated at the foot of Nallamala Hills at the confluence of Tungabhadra and Krishna rivers, Alampur is hailed as Navabrahmeshwara Theertha as it is home to nine temples dedicated to Lord Shiva. The Jogulamba Temple here is considered as one of the Shakthi Peethas. About 2 km from here, the unique Sangameshwara Temple is located at the confluence of seven rivers. Legend has it that the Shiva Lingam here was consecrated by the Pandavas during their exile. The temple submerged after the construction of Srisailam Dam but later resurfaced in the year 2003. The temple is open to devotees when the water levels are low in summer for 40-50 days.